Lead alloy weight, probably a spindle whorl dating from the 13th-15th century AD. The weight is biconical in cross-section and circular in shape with a central hole for the spindle. All surfaces are patinated white and rough to the touch. The whorl is decorated with an untidy criss/cross pattern, probably a number of 'X's within linear borders (possibly pseudo lettering). The decoration is the same on obverse and reverse. 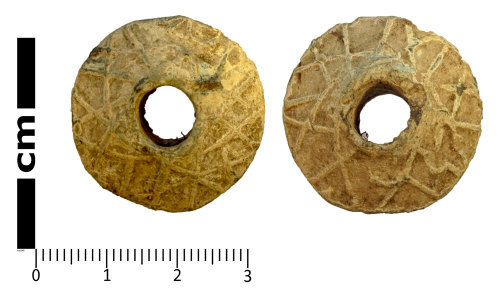 The spindle whorl was made in the same mould or from the same mould template as LANCUM-2C663F. Lead weights like these are common finds, but only rarely from excavated contexts which is why date and origin are difficult to pinpoint. Decorated lead-alloy weights are very rare finds in excavations, but are often found by metal detectorists. They are usually biconical or cylindrical in shape and are decorated on both faces with raised dots and radiating lines or zig-zag ribs. They have been found in ploughsoil over the site of Roman buildings, and in an excavated context dating from the 13th to the 15th century at an Austin Friary (Geake 2001). It is thus very difficult to date the decorated lead weights, and it seems that they could have been in use at any time between the Roman and Late Medieval periods. Helen Geake writes: "Dating of lead whorls is difficult. The drop spindle with which they were used continued in use until the end of the medieval period in London and Winchester (Egan 1998, "The Medieval Household: Daily Living c1150 - c1450"; and Biddle, 1990, "Object and Economy in Medieval Winchester"), and for perhaps a century longer in Norfolk (Margeson, 1993, "Norwich Households: Medieval and Post Medieval finds from Norwich Survey Excavations 1971 - 78"). The excavated assemblage from Winchester contains one lead whorl from a mid to late 10th century context." Undecorated spindle whorls can therefore date from the Roman, Early Medieval or Medieval periods. It has been pointed out that the weight of a spindle whorl is suggestive of the thickness of yarn produced, with lighter spindle whorls (3 - 5 grams) being used for spinning cotton and the heavier ones (30 - 35 grams) for spinning wool (Margeson 1993, 184). Spindles were used to twist fabric fibres together to produce yarn. The whorls attached to the spindle acted as a weight to help to provide momentum whilst spinning and twisting the fibres together. This method of preparing yarn has been in use since prehistoric times and throughout the ages into the Roman, Medieval, Postmedieval and Modern periods. Margeson (1993, page 184) has suggested that the weight of a spindle whorl is demonstrative of the thickness of yarn produced, with lighter spindle whorls (3 - 5 grams) being used for spinning cotton and the heavier ones (30 - 35 grams) for spinning wool. Spindle whorls are difficult to date precisely out of their original context, since they were used through most historical and archaeological periods. Many of the later examples tend to be undecorated. Egan (1998, page 256) has argued that there was an apparent lack of interest in developing decorative styles of spindle whorls during the Medieval period, compared to the decorative examples known from the Roman and Early Medieval periods. Although decorated examples are known of from Medieval and Post Medieval periods.